FlyHigh Aerial is a fun, unique and popular style of yoga, allowing students to practice their asanas whilst supported by a hanging belt suspended from our shala ceilings. 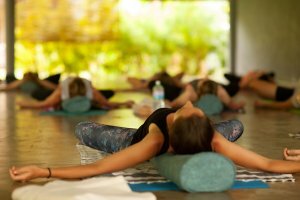 Open to all levels, FlyHigh will explore your yogic creativity allowing you to dive further with inversions, back bends, forward bends, hip openers, shoulder stabilisers and connecting the postures together. The word “vinyasa” can be translated as “arranging something in a special way,” like yoga poses for example. In vinyasa yoga classes, students coordinate movement with breath to flow from one pose to the next. Ashtanga, Baptiste Yoga, Jivamukti, Power Yoga, and Prana Flow could all be considered vinyasa yoga. 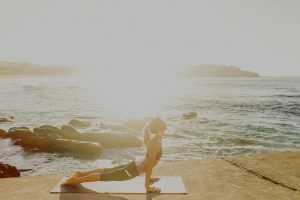 Vinyasa is also the term used to describe a specific sequence of poses (Chaturanga to Upward-Facing Dog to Downward-Facing Dog ) commonly used throughout a vinyasa class .